Ava DuVernay long angry scream of a film was the opening night film of this year’s New York Film Festival. It is a visceral gut punch that is taking no prisoners. Not so much a documentary as call for a complete change of how we view the issue of race as well as criminality. DuVernay has made a film that is vital and alive and important piece of cinema. Beginning with the notion that the 13th Amendment of the US Constitution started institutional racism, DuVernay charts the story of how African Americans were put at the center of the rise of what has become our prison state where an ungodly number of men, mostly Black and other minorities are locked up. She explains how an artificial criminality was used to justify racial inequality. Because laws were used to arrest Blacks and get them out of the way, the statistics could then be used to shore up notions that they were not to be trusted. You could then write more laws to continue keeping the "bad people" under control and justify whatever evil you wanted to justify. The problem is that not only did they poison the minds of whites but the minorities themselves It is so wrong on the most basic level, and gotten so far out of hand that it’s threatening to lay waste to more than just the “criminals” it is supposed to control. It’s a complex issue which DuVerny explains in such a way that there really is no way to argue with her. As a call to arms the film is an absolute must see. It’s a well-made and well-reasoned explanation as to why minorities of all sorts are pissed off with America. It’s a stunning portrait of racism, both intentional and unintentional, in the country. The weight of DuVerny’s argument is simply crushing. It leaves you exhausted and overwhelmed. It's a film that will move emotionally. It may even move you to get off the couch and have you join the movement to make change. This is a film that really should be seen so that the discussion of what to do can begin in earnest. As a social document and a petition for change the film cannot be argued with. However if one takes a step back and looks at 13TH as a film it is not quite as perfect. Before anyone goes crazy and argues that the film shouldn’t be seen as a just as a film or art and reviewed a such, but as political act, one must remember two things , first this is a film website. It’s my job to look at it as a film. I’m not going to say it’s anything less than what it is- a moving experience, I’m simply going to note a few thing. The second thing is that as of the moment is right now, and fuel for the discussion of race and crime there is going to come a time when the film isn’t seen as a living document but as a film that may or may have had an effect. I don’t know how history will see the film but I can see how I view the film and I have to speak my mind. I can’t give it a bye because it is the hot button topic of the moment. The first comment I want to make about the film is not so much with the film itself as with the promotion of it. 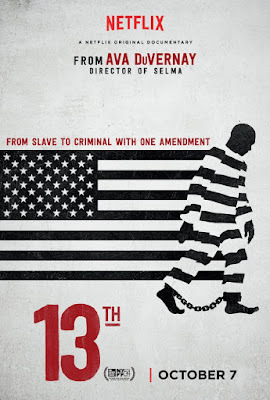 Written up in many places as an exploration of how the 13th Amendment was written as if it were a grand conspiracy to keep the former slaves as slaves from the start, The film is being misrepresented since that really isn’t the case. No evidence presented to that effect in the film. And I'm pretty sure that it were it would be even remotely correct. The film instead states that 13th Amendment created a loophole through which all the racism and hatred the country could muster could be funneled, which is absolutely true. I wish that those talking up the film had chosen their words a bit more carefully because there really wasn't a conspiracy. I'm mentioning this because a couple of people at my day job asked me about the reality behind it since they had never heard it despite having studied law. The other comment I want to make is that as moving as the film is it is very much a film one can admire more than like. I know this isn’t a film that one should like, it is after all a calculated position paper, but it’s not the sort of film that I think is going to result in many repeat screenings. My feeling is that I’ve seen it once, taken in what it has told me, and now I can take the info and do something with it. I don’t need to go back. I mention this because in weighing the film and how I felt about it I realized that there are other equally troubling docs, such as the work of Joshua Oppenheimer, the recent ESPN OJ documentary and SHOAH which I will revisit because there seems to be more I could glean from them on a second, third or more pass by them. In looking at 13th I really don’t feel I need to go back. Yes there are sequences I would like to see again, but I don’t need to see it all again. In order to get it all down into a manageable length DuVerny has masterfully edited together so there are no pauses, no wasted moments because it’s all bullet points. This doesn’t mean it’s not a great film, it is, I’m just not sure I need to go back a second time. I’m also curious how the film will be viewed in five years- will it be a nexus of change or will it be simply a film of a moment. Its too early to know or even speculate. Regardless how I feel 13th is an important film and a must see.